Members of the MSBA State and Local Government Law Section convened on May 18, 2018, at the Washington Suburban Sanitary Commission in Laurel for the Section’s Annual Spring Institute honoring Law Day. 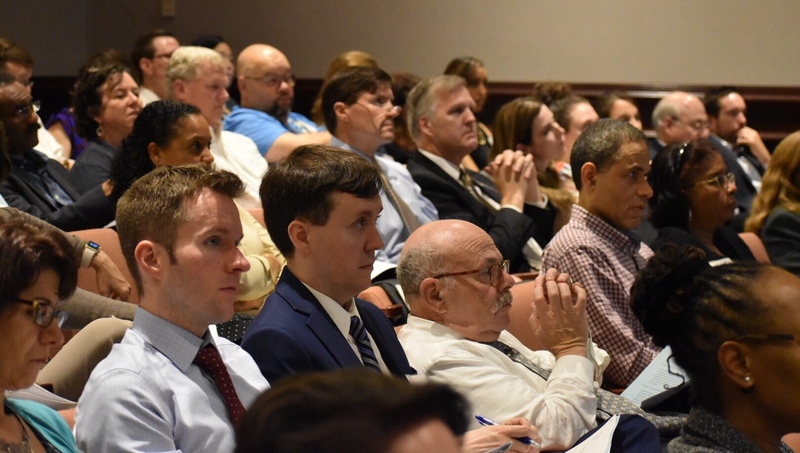 The approximately 85 lawyers and judges in attendance enjoyed a full day of programming on current issues of value to practitioners in the state and local government law arena. Topics included a legislative update, telecommunications issues for Maryland lawyers, medical marijuana, and a U.S. Supreme Court update. The Hon. Glenn T. Harrell, Jr. (ret. ), Hon. Robert N. McDonald, Hon. Alexander Wright, Jr., and Hon. Matthew J. Fader also provided a “Views from the Bench” panel discussion. Hon. Robert N. McDonald (left) and Hon. Glenn T. Harrell, Jr. (ret.) offer their “Views from the Bench”. Section Chair Lynn A. Robeson, Hearing Examiner for the Office of Zoning and Administrative Hearings, said that one of the Section’s greatest strengths is its ability to draw state and local government law attorneys from across Maryland.